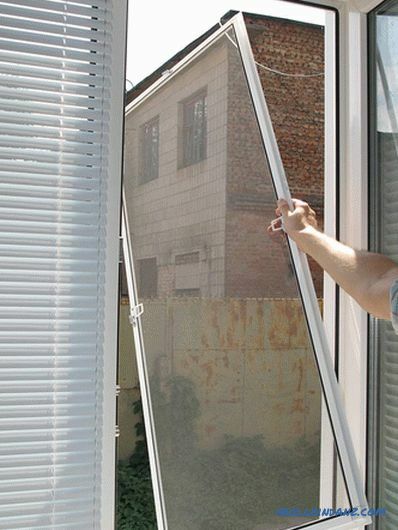 Convenient railing systems have become popular in everyday life relatively recently. 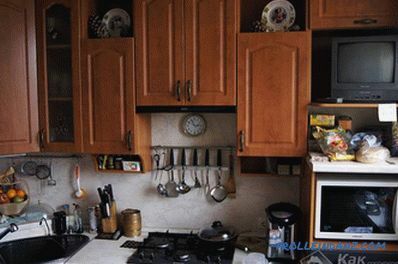 They came from a cafe, where they were originally used in the kitchen, and replaced the bulky storage cabinets for various utensils, thereby streamlining the situation and freeing up additional space. 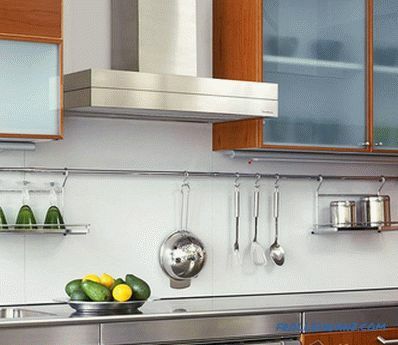 Probably not worth saying that installing a railing in a small kitchen is ideal, and sometimes the only option for the rational use of space. 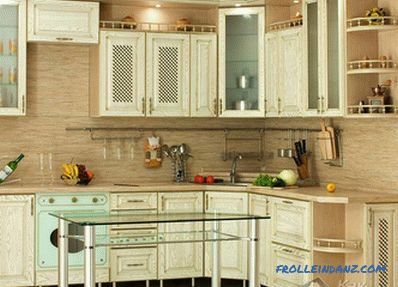 Without going into the aesthetic side of the question of choosing and positioning the rails, we note just the fact that today the roof rails are able to decorate any kitchen, make it stylish and functional. 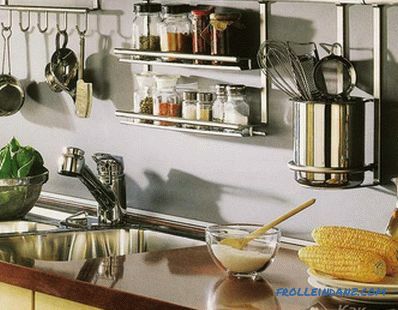 If you dream of the perfect order in the kitchen, where every object is always at hand - install a railing system. 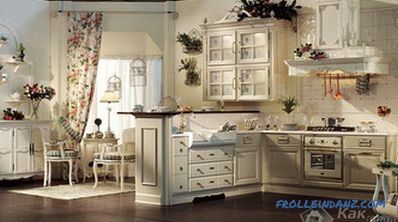 Modern railings will not only help clean up the kitchen, but also decorate it with its magnificent design. 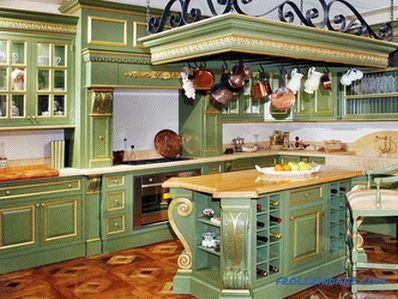 Such a system can easily fit into any interior, and if you want to make a kitchen in the style of Provence or Italian style, there is nothing to think about. 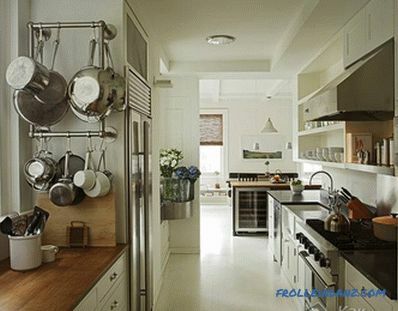 On the hooks beautifully placed dishes, pans, pots and other necessary utensils, without which no hostess can do. 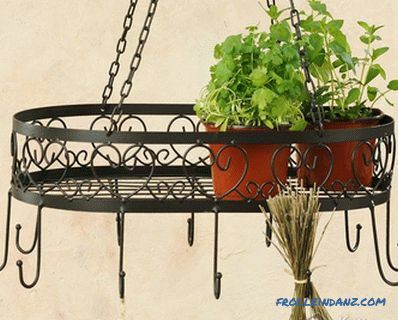 The system is very well thought out: hooks are attached to a durable steel base, on which placed items. Some models have open shelves. 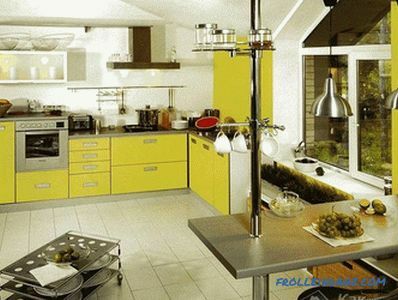 They allow you to do without wall cabinets, which significantly saves space, but does not create confusion. 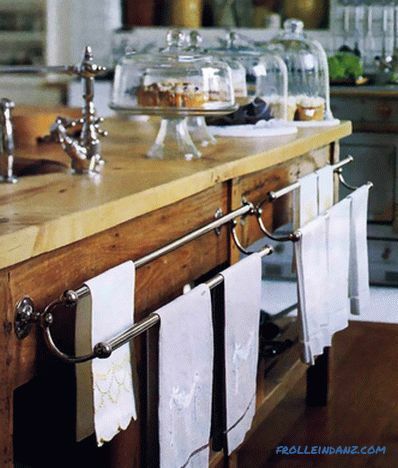 Many railing systems are equipped with kitchen towel holders, stands for cookbooks. 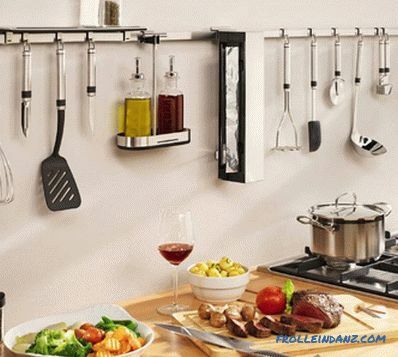 By the way, mobility is the main advantage of railing systems, since they can be installed in any free space on the wall, reinstalled an unlimited number of times, and also if you want to change hooks in places or move them along a metal tubular base. Installation and disassembly is simple. 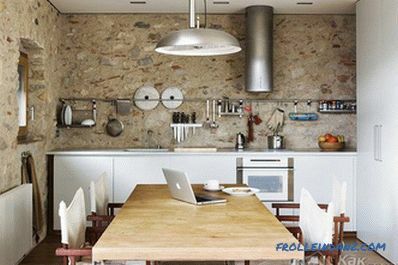 Such systems are usually mounted on the wall in working area. 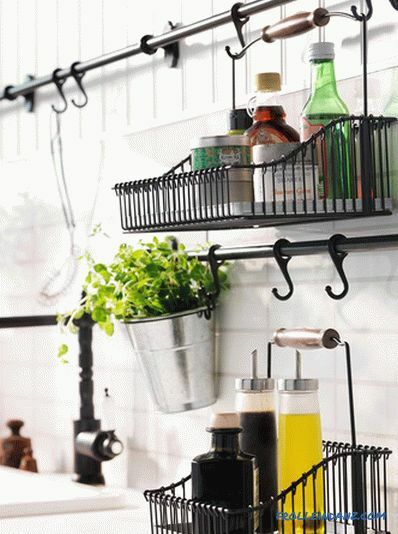 They can be hung between the table top and wall cabinets, or you can replace them. The metal base tube is fixed to the wall with screws, and hooks are put on it, the number of which depends on the wishes and needs. 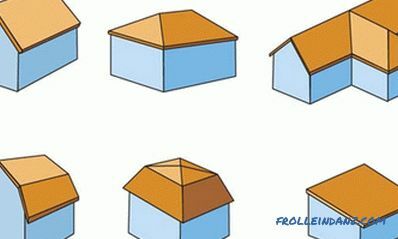 The original version is the installation of the corner system. With her, of course, have to tinker. It is rational to hang such a construction above the sink. 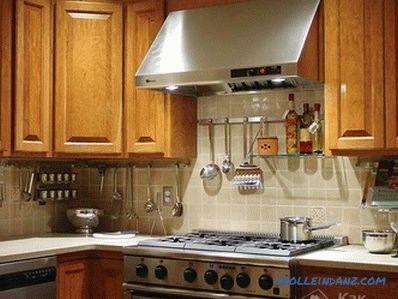 In general, horizontal rails can be placed anywhere: above the stove, at the end of the table top, on the side surface of the cabinet and even fixed inside the wall cabinets or on the door. 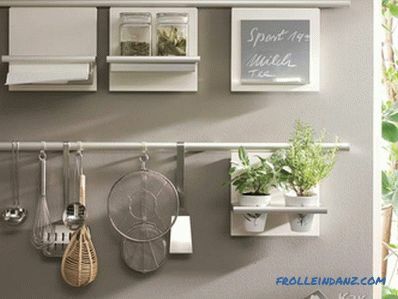 Such systems are indispensable for organizing kitchen space, their placement is very variable and makes it possible to experiment with the design. 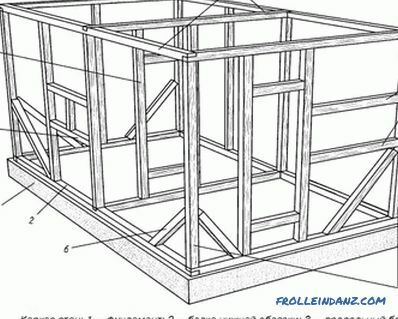 The vertical crossbar-base is fixed with the upper end to the wall at the ceiling, and the lower end goes to the floor or tabletop (depending on the size of the structure). Then shelves are attached to it. Their size and design depends on the selected model. 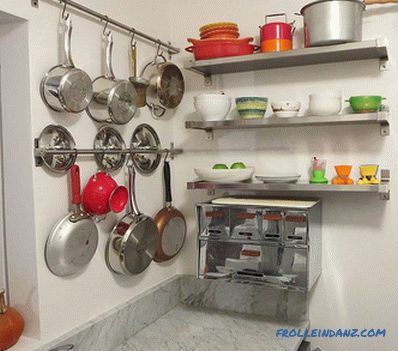 There are metal, wooden, plastic and glass shelves. Before installation, you need to determine how to fix the crossbar on the wall . It will depend on the wall material. The main thing is not to fasten the crossbar "tightly", that is, take into account that the railing can be dismantled and reinstalled elsewhere in the wall. Too weak to fix the crossbar is also impossible, because it must withstand the weight of objects that will be on the hooks or shelves. After marking the walls proceed to installation. Holders are put on the metal basis and slightly fixed by screws. The holders must be positioned in such a way that the screws are at the bottom and not visible. 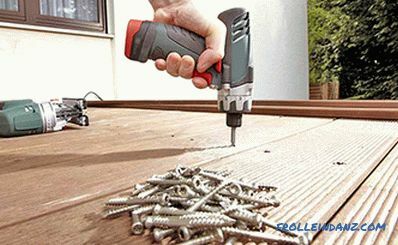 Then you need to attach the entire structure to the wall in order to mark the points for drilling under fasteners, drill holes, put plugs on both sides on the base of the railing and fix it on the wall with screws or self-tapping screws. At the end put on hooks or install shelves. That's all, you can use. 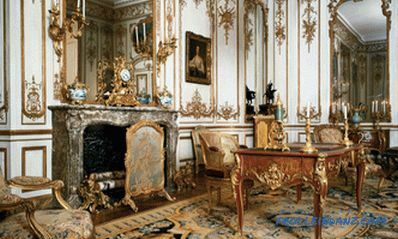 By the way, the rails do not require special care, they are sometimes enough to wipe from dust. Installing rails preferably not too high, optimally at eye level of an adult. For work, you will need a pencil and a building level for marking the wall. It is important to observe symmetry, especially in the case of simultaneous installation of several rails.